by Rose Brewer, Recycling - July 21st, 2010. With the oil spewing out of the BP well in the Gulf, it is hard to talk about anything else about the environment. However, since that is really out of our hands, I would like to share a few bits of information with you. I was reading my Sierra Club magazine and found out that using pesticides on our lawns can kill birds – not just the long term consequence of soft shells in their eggs, but an immediate toxic affect. Check out this PDF about toxicity of pesticides. I did and got an Audubon Chart which I plan to use. Several of these pesticides are dangerous for humans, pets, fish, and bees as well as birds. Also, go to http://bit.ly/lawncare for help in learning to care for gardens with minimal or no use of pesticides. Also, if you need to find a local recycler for something, go to earth 911.com. Type in the item that you want to recycle and give your address. Then you’ll get the nearest recycler. Now, it gives recyclers within 25 miles and sometimes there is not a recycler of that item within 25 miles. But, its another good tool for when you want to recycle something. As my husband and I walk in the neighborhood, it seems that we have fewer people putting out their green bins. Please let me know if you need any information or help. 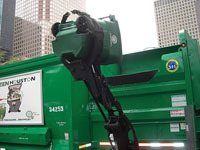 The next recycling opportunity for neighborhoods in Houston is to get Automated Recycling. It is only in a few neighborhoods, but the ones who have it have recycling participation rates of over 50 %. Increasing our participation rate would, therefore, not only be better for the environment, and save money for the City (and therefore ourselves), but would also be a possible step in getting this new style of recycling. The carts that are used are 96 gallon green bins similar to the garbage cans that we have. All the recyclables would go into it and we could recycle glass in these bins if we were chosen for this program. Please, let me know what I can do to help you recycle.